The past few days have been cra-aaaaa-zy around here. I’m so sore and tired. My joints are aching. Besides deciding to start a rigorous running program (I’m serious, don’t laugh!) 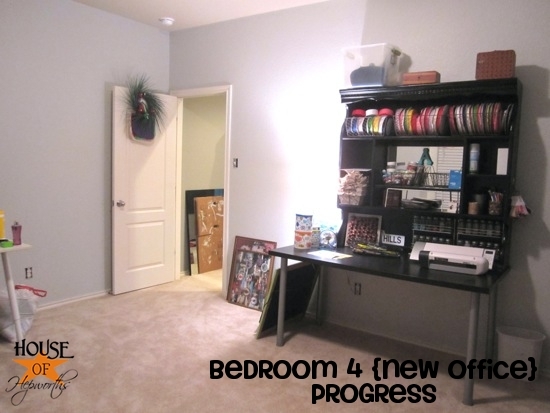 Ben and I spent the last few days flip-flopping the office and the guest room. 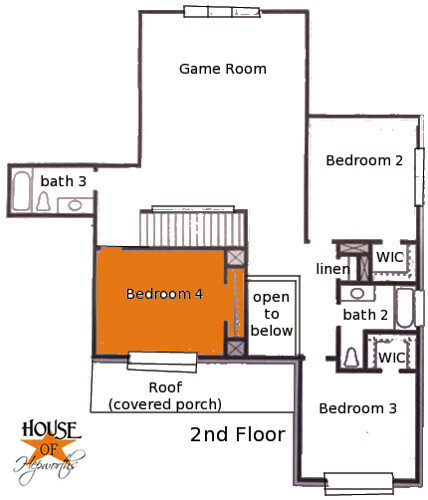 For a point of reference, here’s our floor plan with each room marked. 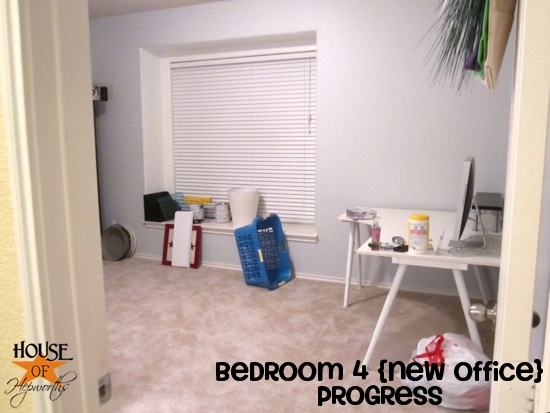 Before the ol’ flip-a-roonie, the office was “bedroom 5” and the guest room was “bedroom 4”. There are names for this. Hoarder comes to mind. Slob. Pack-rat. Um, ya. 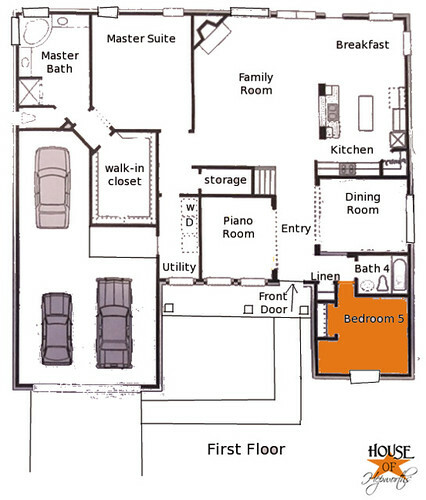 …which is why we wanted to flip rooms with the guest bedroom (bedroom 4). 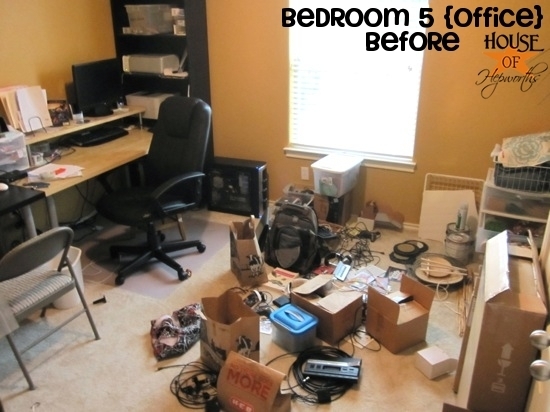 You see, the guest bedroom is a lot bigger than the office, which is obviously our biggest issue with sharing an office – we just flat-out don’t have enough space for all the crap. Only problem with doing a big flip? If you thought the orange office was uninviting, the guest room is far worse. 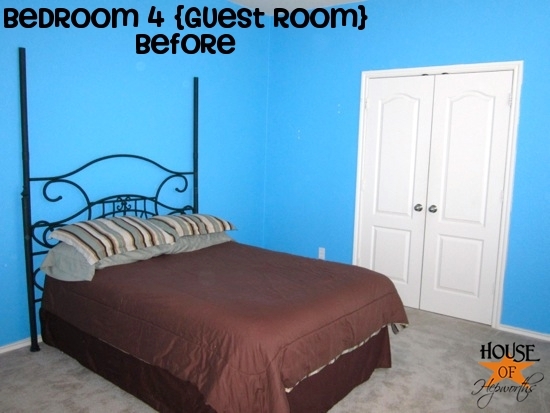 We’ve affectionately named the guest room, “the smurf blue room”. Can you guess why? I pretty much quit going into the office as much as possible because the orange was so horrible to look at. I just couldn’t work in there. But now, smurf blue? There’s an even smaller chance I’ll go into that room! 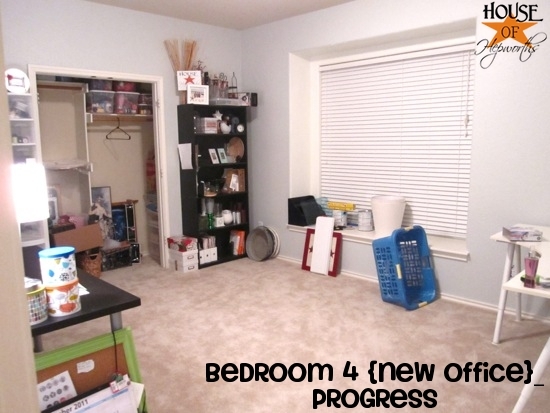 I’ve been wanting to flip rooms for awhile, but besides the daunting task of carrying an overflowing office full of crap upstairs, and the guest furniture downstairs, I also knew there was no-way-in-hades I’d agree to move rooms until we painted the smurf room first. By some fate that can only be described as a miracle, I actually talked Ben into painting again. And so it began. 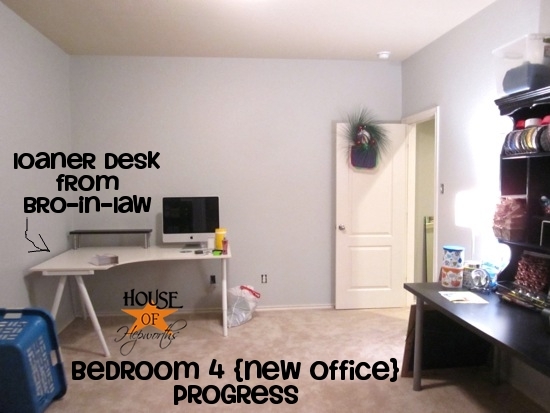 The great guest room/office flip. 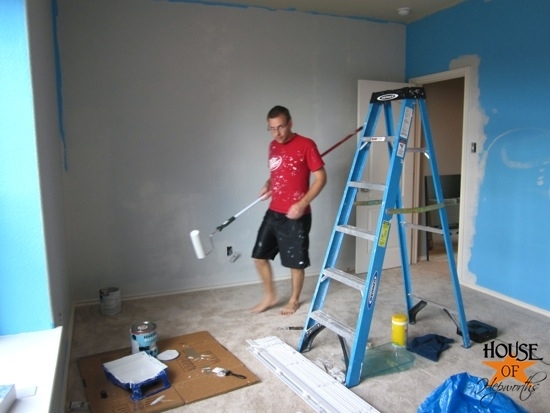 Doesn’t he look so thrilled to be painting? Ben and I have a pretty good system worked out. He rolls, I cut. Fortunately we had a 3rd helper to make the job go quicker. After about a day we were totally finished puttying, painting, cutting, rolling, and edging. 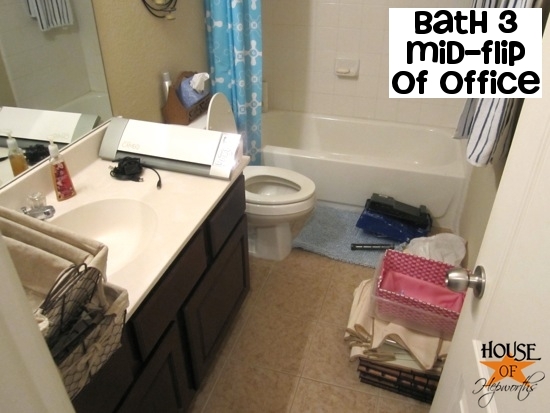 This kind of overhaul really tears apart the entire house though. Here’s the piles of crap we had to maneuver around for the past few days. Matter of fact, we are still maneuvering around all this crap. Why do things have to get worse before they get better? 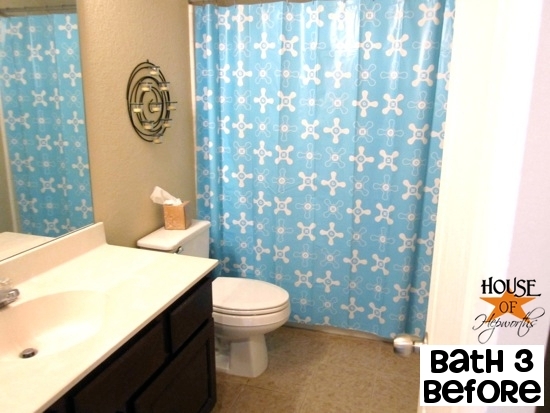 Check out or b-o-r-i-n-g bathroom off the gameroom (bath 3). 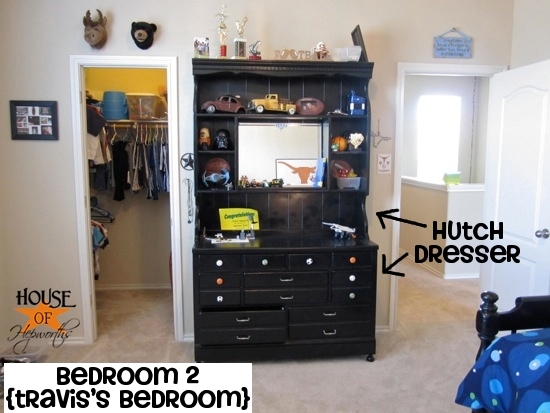 And while I’m talking about random stupid crap totally unrelated to painting, can I just point out the main reason this room was never even considered for either kid? 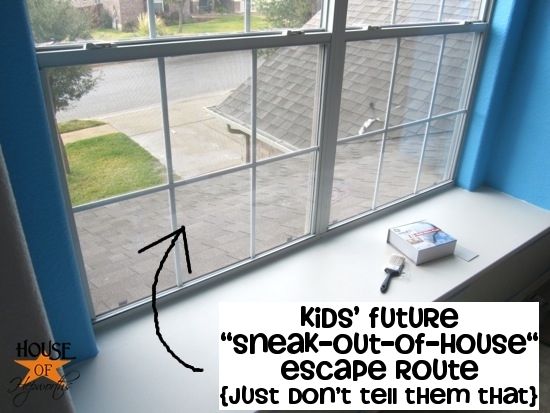 Hello sneak-out-route! Please don’t tell me you never crawled out a window and jumped off a 1st story roof. This is just asking to be snuck sneaked out of. So ya, hopefully my kids won’t ever read this post and figure this out. Because my Travis, he’s a monkey and would probably jump off the roof tomorrow (at 9 years old) if I let him. So, back to the post. Where was I? Oh, painting. Right. In case you are wondering about the color, I chose it in about 5 minutes off the Martha Stewart paint card. I wanted something similar to my gray in my living room, but even lighter and super neutral. So, are you dying to see the big reveal? Ya, me too! I wish it were done! ha. But for now, I’ll at least show you the not-as-messy “progress” report. Here goes nothing. One of the new additions is this hutch that I just stuck on top of my current ikea desk. So far it has worked out great and I’m really diggin’ it. It is suppose to go on top of my son’s dresser, but I got sick of cleaning piles and piles of legos off it, so I took it away and moved his dresser into his closet. He loves it because now he has more floor space for even more lego messes. The hutch has sat in the guest room unused for a few months, so I decided to try it out on the desk, and I love it! 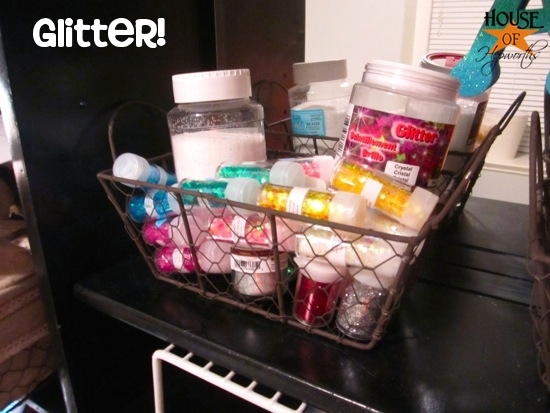 I love having easy access to my craft supplies. As for the previous office/future guest room, it’s lookin’ like a fool with it’s pants on the ground still needs a lot of work. And a lot more moving. So there you have it. Besides a nice dinner, this is pretty much what Ben and I did for our 13th wedding anniversary – we painted and moved. Good times. I’ll update as I continue to get this mess cleared up and organized. 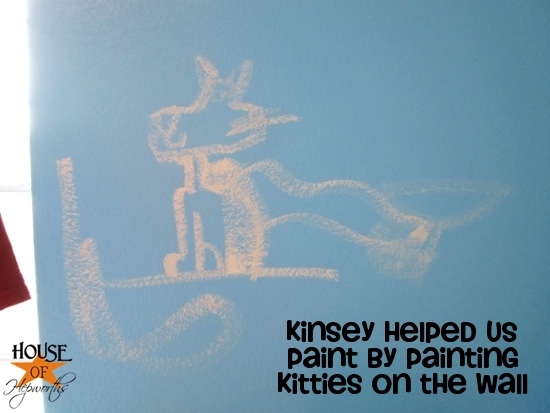 I so want to paint the orange room now (previous office/new guest room), but I have been promising Kinsey I’ll paint her room *next*, so until her room is painted, I’m not painting any other rooms! What did you do over the weekend? Hopefully something way more fun than painting and moving! Fabulous! Great solution! 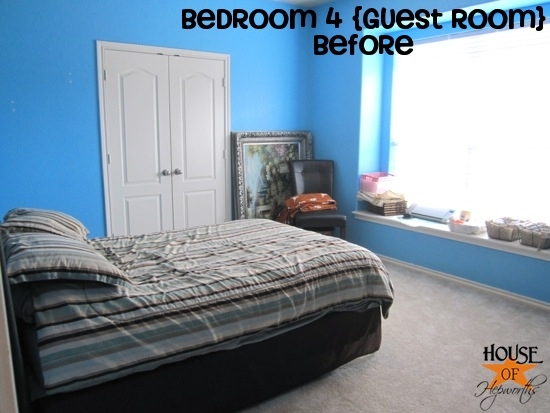 I was thinking that it would probably be smart to have your guest room like that and you were a smartie for doing that! We originally put the guest room upstairs b/c we wanted the office downstairs (so we didn’t have to walk as far to go to the office). Lazy. Yup. But it really does make way more sense to have the guest room on the 1st floor. Aaack! Love the mounted heads in Travis’ room! 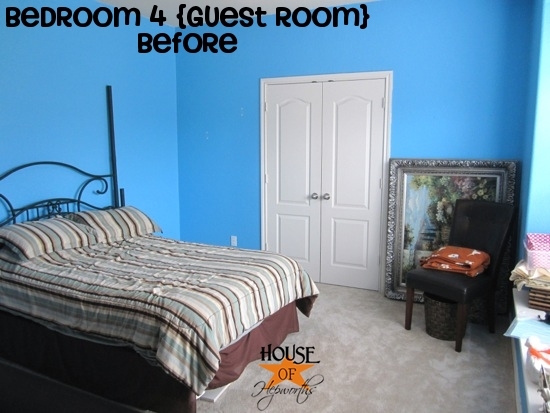 Fab job with the room….did it take more than two coats to cover that smurf blue? Nope, 2 coats! Can you believe it?! 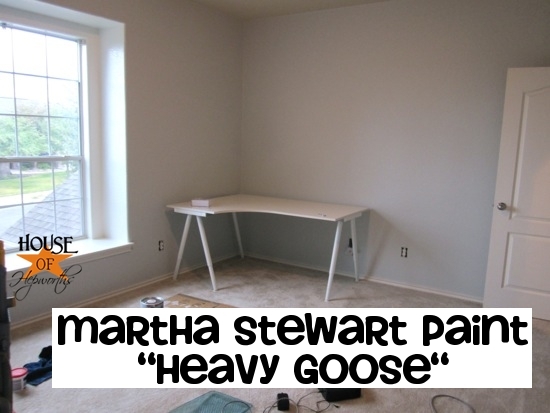 That Martha Stewart paint is the best. Geez, you are busy! Would you care to tell me what the font on your pictures is? The font is called Howser and I have no idea where I downloaded it from. I get all my fonts from free font sites. Awesomeness girl! Congrats on your 13th Anniversary. Keep on Keepin on…lol! We are still no where near done. Ben has to move ALL his stuff still. UGH. It looks like so much work, but I know you’ll be so happy with both of the finished rooms. I love the difference a can of paint can make. The hutch is perfect for your desk. L-O-V-E your station for ribbons. 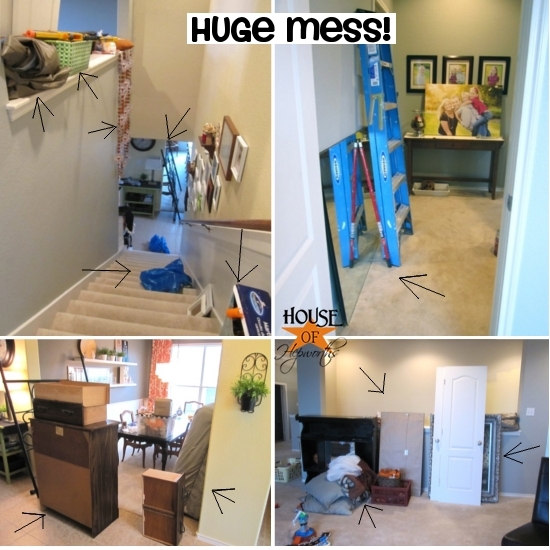 We’re still in the death throws of a major renovation so I feel your pain with the mess. Last night at midnight we were putting a couch and table back into our living room/dining room so that 10 from work will have a place to eat and sit down tonight. Soon, it will be over. Soon. Okay. This is why you are my favorite blogger EVAH! My office looks EXACTLY like your office in the “before” pics. No lie. Thanks for keeping it real. 😉 Seriously, all of your hard work in your house is quite inspirational and I love your sense of humor. I’ve never commented before, but have read where you have received some not-so-nice comments before and just wanted to say “You GO girl!” Haters gonna hate. You just keep doing your thing. There are tons of us who can’t get enough! Blessings! I seriously laughed my head off. So rude, but I found it quite hilarious. Allison, Looks great! I love the new paint color on the wall. 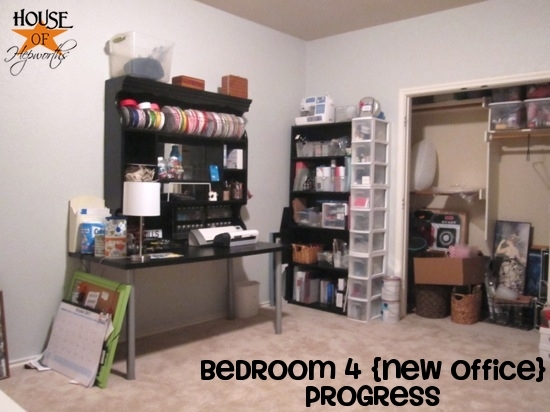 I have a guestbedroom/craft room, that realy needs organized. Thank you for the motivation! Wow. That blue hurts every time I see it. 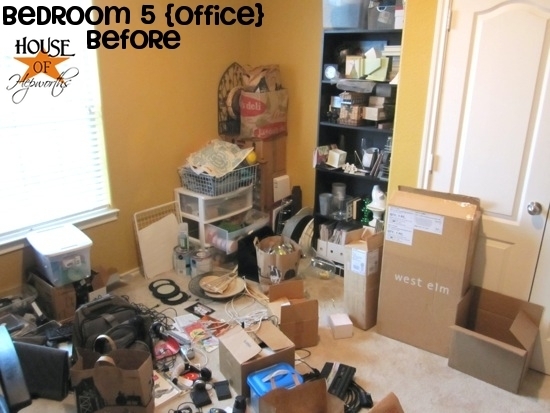 Love the post – it’s reassuring to know I’m not the only one with a disaster area where her office is supposed to be. I’m usually really organized. That is what kills me about this office. There just wasn’t enough space for all my stuff. And mix in Ben’s stuff – yikes! And he is NOT organized, so it was just a total train wreck. Girl, you crack me up. But it’s SO true! People assume (mistakenly) that since I paint murals I must like painting walls. As in, like, a room? Gah! I HATE it!!! Even tho we have the same agreement – Hubs rolls in like 15 minutes and wonders why I’m still crawling on the floor cutting in an hour later. I’m gonna save this post and the next time a ‘friend’ says, Hey, YOU paint walls all the time, right? read: come help me! – I’m gonna share this with them. 😀 Thanks for the smile this a.m. I seriously hate painting. Which is ironic b/c I’ve painted the whole house myself. It’s just too expensive to hire a painter. But you know what I loathe more than anything else? I despise painting moulding and trim. Gah. I hate that. 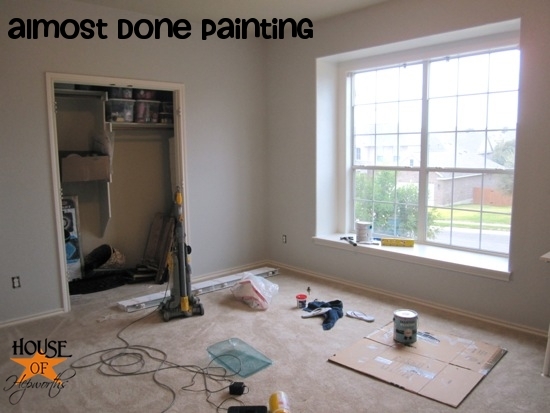 Door frames, doors, moulding, baseboards, trim. Worst.Chore.Ever. In fact, I hate it so much I might actually hire out and just have all my trim repainted in my whole house at once. Get it over with. Hey, what a coincidence – I started a major running program this week too! Ok, I really started it 3 months ago, but this week I’m actually DOING it! In fact, I just (about 10 minutes ago) finished a 30 minute run with 5 min walk warm up and 5 min walk cool down. At my weight, that’s saying something! One of the best things for me is plugging my exercise into my ticker (I use http://www.myfitnesspal.com/) and seeing I burned more than 400!!! calories this morning. Now if I can just stay away from the halloween candy, I’ll be set! I SPY SOMETHING THAT LOOKS LIKE A LONGHORN IN A MIRROR!! WHERE THE HECK DID IT GO? I am sooooo glad you got rid of the smurf blue!!!! 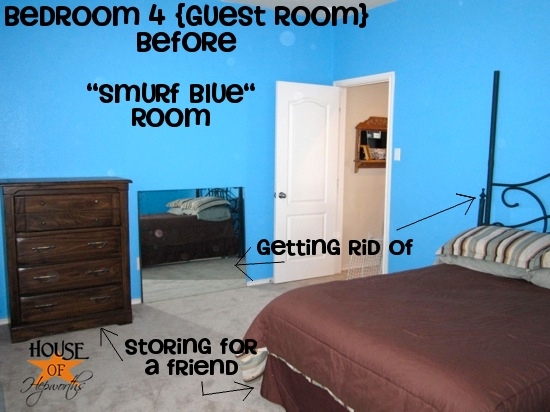 I’m prolly the ONLY PERSON ON EARTH who hates blue rooms! 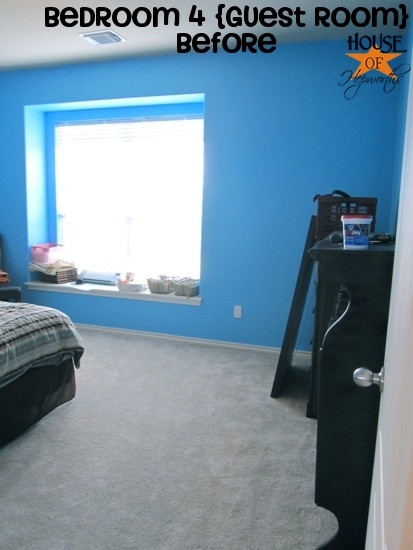 I’m not even fond of very pale blue rooms!! Don’t want ANY ROOMS in our house with ANY traces of blue on walls or rugs or pillows or anything, really. Guess what my favorite color is? Ok, ok, I know you’re a smart azz and already know it’s blue!! But that’s TO WEAR, not to have in my house!! I DO have a couple of things that are super valuable and passed down through my family to me and I do kind of let some of them show just a tad but behind locked glass doors in really beautiful cabinest…we can’t leave them sitting out! Somebody (our house is nearly always full of people) might knock them over and I’d really be sick even though I really hate them b/c they would be lovely if they weren’t blue!! Wow-what a make over-great idea and everything is sooooo much nicer and the space gained is great, too!! I LOVE that look on Ben’s face while he’s painting, too!! Says it all~!! lol Too funny and really made me laugh…sorry Ben!! I’m too afraid to paint in this house-hire it done always by decorator’s favorite picked people but I DO paint on canvas, wood, metal and all kinds of craft painting but honestly haven’t lately. I have a studio set up just for crafting and I used to use it a lot but now I’ve gone into different things-phases of our lives as we grow older change. Well be sure to watch that window!!!!! Better put bars on it-or yea, somebody will be breaking an ankle, leg or something!! If you KNOW you can’t top them, then put a trampoline under it to cushion the fall you know may happen eventually….oh boy that’s nice-helping out your kids….lol!! Well, just trying to help!! I love how everything turned out and I can’t imagine all that work done by yourself and Ben!! Don’t ya’ll know how to delegate? You have your friends over and have a little food, a little wine-and there ya go-instant workers….can’t you just see what they’d do? Oops, sorry! I didn’t mean to imply they coudn’t hold their liquor…but doubt a couple of glasses of wine would be so bad but just SHOW the food-then tell them they must wait to have it when the work is complete!! D.E.L.E.G.A.T.E.~!!!! I KNOW you have friends who’ love to help you-remember that next time you take on something that big. ha!! 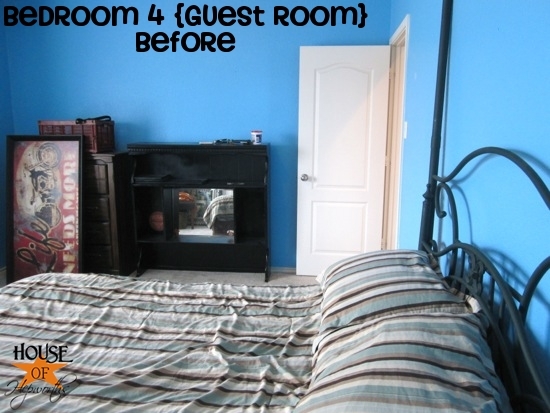 Sorry but it went with the smurf blue room and I DO HOPE it went….too!! So glad you got rid of the smurf blue. So much better. Great job on the flip and reorganization. Look at all those calories you’re burning off. You go girl!! Isnt it funny how even when everything is in a disarray you can totally see in your minds eye where it is all going to go and how perfectly everything will fit in its new home?? Loving this transformation!! Btw, CONGRATULATIONS on your anniversary! i so need a bigger house! Holy crap! I think whoever painted that house the first time went into a paint store and asked for a gallon of every color, WHOA! Smurf blue it sure was! Love the new color and you guys will like the bigger space. 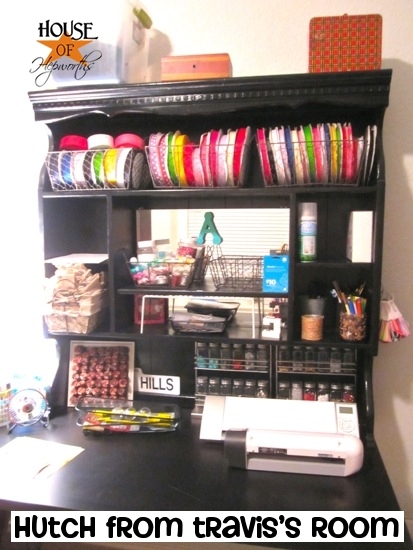 It won’t hurt that it’s out of sight on the 2nd floor either, who wants to have to keep an office/craft space neat?! that defeats the purpose! happy anniv sweets! No problem, the name was enough 🙂 Found it! Thank you! Ugh, that blue makes me want to rip my eye balls out! I don’t think it could sleep in that room. It looks fantastic! Love the color and that hutch is perfect! 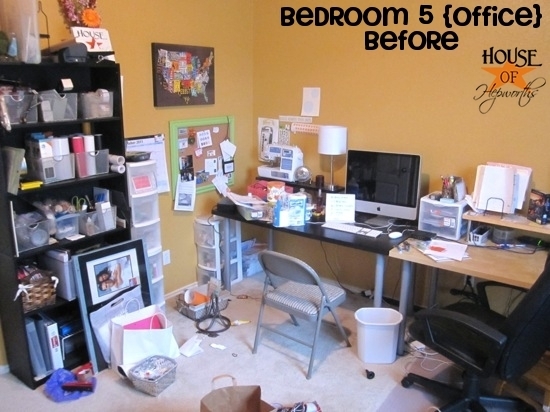 Great makeover of your office and guest rooms. You have documented everything really well.